EA Sports just announced a great new addition to FIFA 18, arguably the greatest game franchise of all time! With the impending 2018 World Cup in Russia on the horizon, they are unleashing a World Cup mode for all football fanatics to enjoy. This is great news! It’s like a new game within a game, so this will keep you really busy in between watching the real World Cup this summer. The official reveal trailer for this brand new set of game modes for FIFA 18 dropped just yesterday, and it stars poster boy Cristiano Ronaldo too, so let’s check it out! 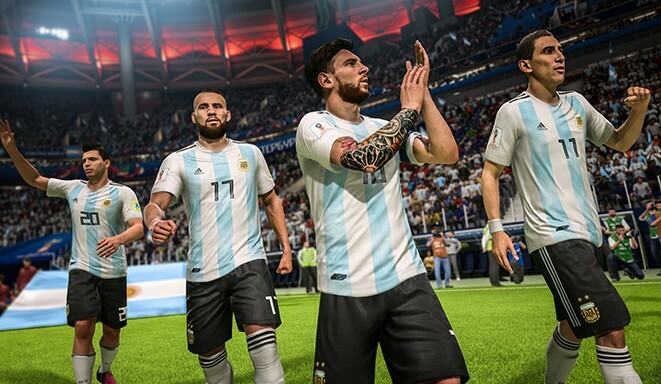 This free FIFA World Cup Russia expansion pack for FIFA 18 has a few different game modes, apart from all the official World Cup squads from the 32 teams that qualified for the tournament, plus with enhanced graphics. The different game modes include the official 2018 FIFA World Cup Russia mode, where you can play through the authentic tournament with the team of your choice. Also included comes Custom FIFA World Cup Tournament mode, which is your chance to rewrite history by choosing non qualified teams like Italy, Chile, USA or the Netherlands, and then lead them to glory in the World Cup in your customised World Cup draw. This is of course a great option for supporters of the teams that lost out or didn’t even qualify. Finally, there’s the FIFA World Cup Kick-Off mode, helping you to go straight to the action with all the official International teams, in offline mode or with friends. Moreover, what most people are excited about is the new FIFA World Cup Ultimate Team mode, which will play out just like the Ultimate Team mode that we all know, but using the players in the official Russia World Cup, as opposed to players from club teams. This new mode will most definitely dominate the Ultimate Team landscape this summer, so get to building those teams, and do it quickly in order to enjoy the whole World Cup season with FIFA 18. The Ultimate Team mode will include Icons from World Cup history, which differ from the Icons already in FIFA 2018. You may just get David Beckham from the Three Lions, crossing in a ball for Gary “Mr. Walkers Crisps” Lineker, if you should be so lucky. Or how about Diego Maradona playing in Gabriel Batistuta for the Argies, and then scoring past Claudio Taffarel of Brazil, for good measure? Who knows? The available Icons will be revealed in due time. In some even greater news for avid FIFA 18 fans, there’s a Double Pack Incentive on FUT player packs, meaning for every player pack you buy in the FIFA World Cup Ultimate Team mode, you will receive an equivalent pack in the FUT 18 club game. That’s a win-win situation right there! So be prepared to purchase your FIFA points and spread it on thick. So there you have it! We can’t wait for this update, and we’re sure you feel the same, and for a further breakdown of the new FIFA World Cup Russia 2018 game mode, check in with BMOnus down below on their YouTube channel, for even more information on this latest expansion for FIFA 18. Remember the May 29th Release!